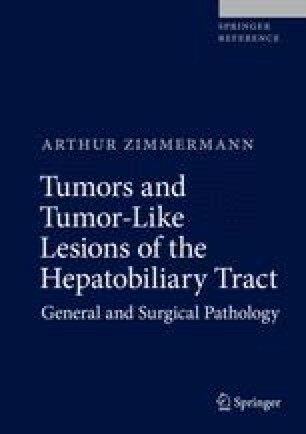 Liver infarcts are macroscopic parenchymal alterations that may mimic, through their mass effect, neoplastic processes. An anemic infarct or infarction of the liver is defined as an ischemic necrosis that is usually caused by hepatic artery occlusion, thrombosis of the celiac artery, portal vein occlusion, or mixed hepatic vascular occlusions. Although hepatic artery circulation is crucial for the biliary tract, acute occlusion of this artery can also cause hepatic ischemic necrosis. Anemic liver infarcts are well-demarcated pale areas of sometimes more than 10 cm diameter, often wedge shaped and located both peripherally and deep in the liver substance. These lesions can undergo secondary changes, including abscess formation following infection, hemorrhage, liquefaction, calcification, bile accumulation, and fibrosis/scarring. Large infarcts may be separated from preserved liver parenchyma, a process termed sequestration. In contrast to true infarct, hepatic pseudo-infarct or Zahn’s infarct is a well-demarcated zone of hepatic congestion leading to parenchymal atrophy.